Spend some quality time with the lizard king! Chinchorro Atoll (Banco Chinchorro) is the largest atoll in the western hemisphere. It is also the best place in the world to get close to American crocodiles. 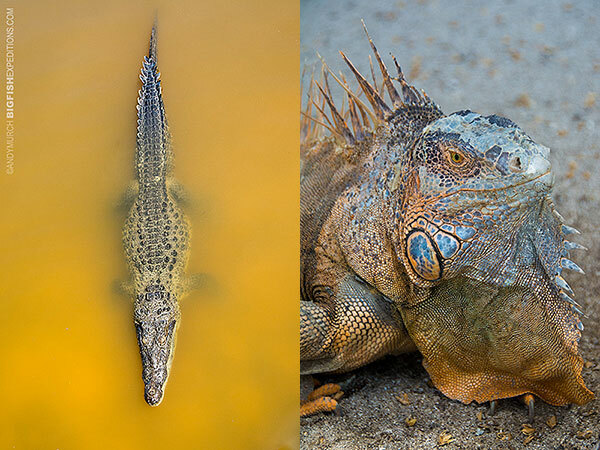 The spectacular viewing and photographic opportunities at Chinchorro are the result of years of careful planning and experimentation to make this the best and safest encounter that it can be. Join us in Mexico for an expedition you will never forget! Enjoy the pristine reefs of Xcalak and Chinchorro! In addition to three days of crocodile encounters, we will also have an opportunity to enjoy some of the best diving in the Mexican Caribbean. The coral reefs around Xcalak are in excellent condition and range from shallow patch reefs (where we sometimes see manatees) to deep walls covered in healthy sponges and large stands of black coral. This crocodile diving adventure is an expedition in the true sense of the word. We are heading far off the tourist track where you won’t find luxuries like wifi and lattes. We will be sleeping in a simple fishermen’s cottage near the island. If you fancy the notion of kicking back in a hammock where all you can hear is the sound of the ocean then this is the trip for you. If you’ve been there and done that and like the idea of roughing it a little in order to get in the water with an animal that few people will ever encounter, this will be an adventure you’ll never forget! Day 1 Meet in Cancun at 12 noon and drive to Xcalak. Overnight hotel in Xcalak included. Day 2 Morning two tank dive in Xcalak looking for West Indian manatees and diving with schools of tarpon. Afternoon free to relax and explore the area. Day 3 Early departure for Chinchorro. Single tank dive on the reefs of Chinchorro. Then snorkel with crocs all afternoon. Day 4 After breakfast we will head out on another dive and then go to the Island to look for the giant iguanas and walk around the fishermen´s camps. Then back to snorkel with the crocodiles until dark. Day 5 Same as above except that we will depart around 3pm for Xcalak.